Want to know everything about your site? Use SEO PowerSuite to know all the possible SEO-related details about your site. This SEO software lets you optimize your or your client’s site using 4 software tools included into suite. Move to trash free but ineffective SEO tools that do nothing: start using effective SEO software. Each of the products presented in SEO PowerSuite has its own purpose. Each of them has a great number of specific features that will let you optimize your site the way Google will love it! SEO PowerSuite consists of: -Rank Tracker is great at checking rankings and telling you how profitable your keywords are. It also includes a powerful keyword idea module that will help you find new promising keywords in your niche. Schedule & export reports on auto-pilot using a built-in scheduler. Connect your Google Analytics account. 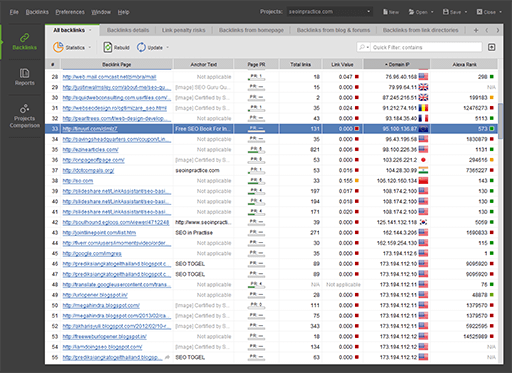 -WebSite Auditor is helpful in analyzing your site for server sideCSSHTML errors and on-page content optimization. Evaluate the general state of your site & optimization level of the individual pages for a particular keyword. You can easily see all the meta-information (keywords, meta-description) for each of the pages in just 1 table. Optimize content of your landing pages to outscore top 10 competitors for page optimization metrics. Use the advice the program gives you. -SEO SpyGlass is a backlink tool that enables you to find and analyze backlinks to your and your competitor’s sites. Find the most promising backlink partners. Find toxic links that could affect your site’s rankings in Google. -LinkAssistant is a backlink building tool: you can verify if your backlinks are still active & build more links using special techniques the program offers you. Each of the tools lets you export and print professionally looking reports in HTML and PDF formats. Save them on your hard drive, upload them via FTP, schedule them to be sent via e-mail and more! Try SEO PowerSuite for FREE and save time for other stuff!